Actor, writer, raconteur, geek, and all-around-good-guy Wil Wheaton offers a wonderful bit on his blog about remembering what it is we do; “to make something, where nothing was before“. Black Gate Magazine has really blown me away of late with their “On Writing Fantasy” and “Chasing the Dragon” series of blog entries on, well, writing. This entry on “A Timeless Style” by John R. Fultz is excellent, with loads of examples and suggestions on creating your own voice in your writing. In “Moving the Plot“, Australian author Cassandra Jade offers up great advice for moving the plot forward: “The plot moves forward when you know where you are and where you want to go and you know why your characters are taking those steps.” It sounds glib, but this is what plot movement boils down to: knowing where you’re going and getting there. 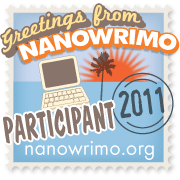 Jim Warner, guest-blogging on QueryTracker.net’s blog, presents this 2-part blog on “The Rejection Blues” (Part 1 and Part 2). This one hits a little too close to home (still no sales on my “Hope and Rejection 2010” story tour…) but really offers some very rational advice to handling what often appears arbitrary and irrational. User “Aught3”, on the forum “League of Reason“, eloquently puts forward the proposition that “You Can’t Be Good Without Sci-Fi“. He makes some very good points about the ability to use science fiction as a working model to address moral problems without the pressure-cooker atmosphere of “real” cultural and societal bias or pressures. The idea could easily be applied to fantasy as well. As an argument for the benefits of reading and creating science fiction, it is a barnburner. However, I don’t quite buy the stated premise (you can’t be good without sci-fi) due to the simple fact that people were good before sci-fi and people are currently doing good without it. Nevertheless, a very interesting and thought provoking read. This entry was posted in Ramblings, Tips and Tricks and tagged black gate, blog, cassandra jade, inspiration, jim warner, john fultz, league of reason, novel, philosophy, rejection, sci-fi, wil wheaton, writing. Bookmark the permalink. Thanks for sharing these links – and for including mine.